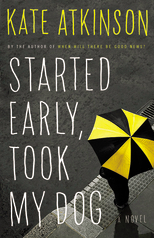 Kate Atkinson’s newest book, STARTED EARLY, TOOK MY DOG, is being released on March 21, and we’re so excited about it, we asked the fine folks at Hachette if we could host a read-along for it and they were kind enough to say yes! They’re offering a copy of the book to the first 10 Reagan Arthur Books Challenge participants to sign up! If you’ve signed up for the Reagan Arthur Book Challenge (remember….it’s not too late to join) and would like a copy of the book so that you can participate, fill out this form. Anyone can join in the chat, but you must be a member of the challenge to sign up for a book. I love Kate Atkinson's book and especially the Jackson Brodie series, and I'm pretty sure you will too. If you like to sign up (and receive your free book), click here. Darn, I forgot to sign up in time.I would have loved to participate. I look forward to see what everyone thinks of this book. I love Kate Atkinson and will look for this book later in the month. OH, I have had this out from the library a couple of times (it came out earlier here) but have returned it unread. I might request it again and see if I can read it as part of the readathon.